In F1 there are no ends; it is a continuum. For weeks and months we predict with supreme confidence that the opening race weekend will answer the key questions of who's hot and who's not. And indeed it does answer many of them. But the trouble is that it creates a few more at the same time. And so it was at Melbourne. 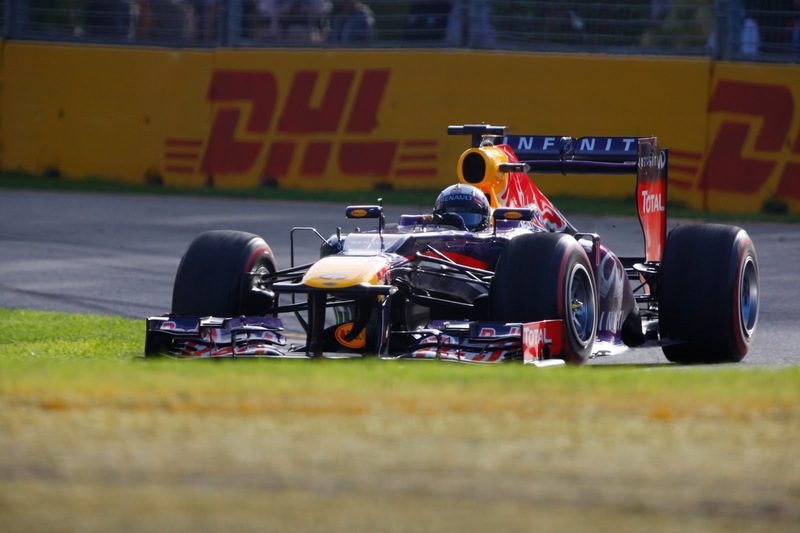 Does Sebastian Vettel remain the title favourite? Sebastian Vettel's Red Bull didn't run and hide in the race after all, despite practice and qualifying suggesting that it would. 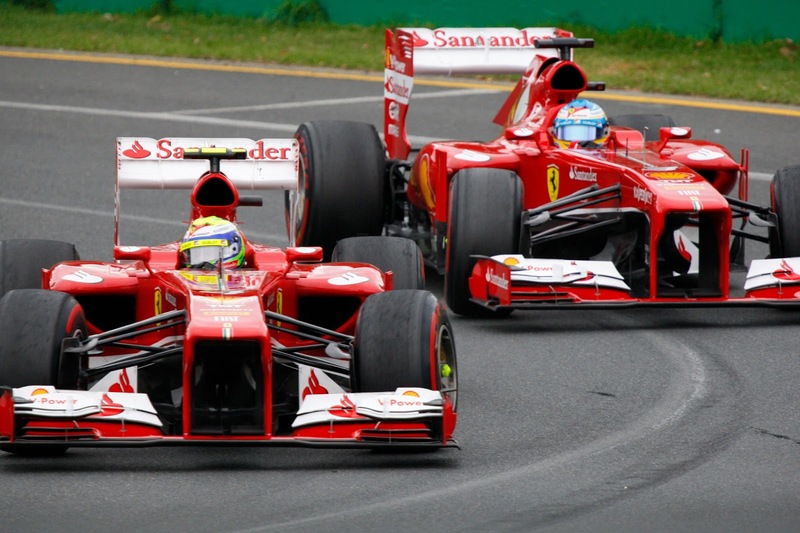 Instead, Kimi Raikkonen's Lotus won dominantly, and Fernando Alonso's Ferrari cleared Seb too. And while it was a surprise triumph for the Enstone team, perhaps we should have seen it coming. Lotus can be considered the forgotten contenders in 2013 season previews: the E21 had after all looked to handle extremely well in Jerez testing, and Romain Grosjean undertook an ominously pacy longer run in Barcelona. Yet it seemed the car's reliability troubles diverted attention somewhat. And Alonso and Ferrari will also be well satisfied with their debut. It's early days of course, but even after one round a Raikkonen-Alonso-Vettel battle for title honours in 2013 looks by far most likely. But, without wishing to play the role of the bad fairy at Sleeping Beauty's christening, did Melbourne's race contain a clue that Kimi and Lotus will suffer from the same overarching problem as last year, that while it may be the fastest car on race day it too often gives its drivers too much to do from low grid slots? Kimi after all qualified seventh in Melbourne, some 1.3 seconds over Seb's pace. As it was, circumstances meant that he wasn't held up much in the race, and indeed was right on the tail of Seb and the Ferraris from early on, but can he count on that every time? As for Red Bull, Christian Horner was at pains to state that his cars' disappointing race day in Melbourne was down to the peculiar low temperatures along with Pirelli's ultra-aggressive tyre compound selection. In a week's time, when all run in the heat of Malaysia and around Sepang track's long fast corners, with harder tyres, we'll find out how much credence lays within Horner's defence. But the problem is that Lotus in theory at least should go even better in many of those circumstances too, and for all we talk of Melbourne's Albert Park track being unusual the record of subsequent circuits suddenly offering salvation to those who struggled there is actually rather limited. And whatever the case, it's hard to cite examples of Red Bull being caught out by tyre compound selection and/or track temperature at any point before in the last three years (and of course they are the same for everyone). But to repeat a point that I labour, in contemporary F1 no one is going to get rich betting against Red Bull. The cars' stunning lap times of practice and qualifying did not suddenly become irrelevant within an hour and a half of racing around Albert Park, neither did its conspicuously sound handling on display in testing. It's not for nothing that Alonso, and one assumes plenty of others, still considers Red Bull as the team to beat in 2013. Let me tell you a story, one that on the face of it has little to do with F1. A group of researchers in the name of research booked themselves into a psychiatric hospital as patients. The researchers were perfectly sane (whatever that means), and the idea was that they would act within the hospital entirely as they would do normally, to see how quickly the doctors would realise that they had no need to be there. However, they found that the doctors never reached this conclusion, as they instead interpreted all of their behaviour, however 'normal', as evidence of mental illness. For example, one doctor upon spotting one of the researchers taking notes of his experiences, noted that the 'patient' was 'experiencing writing behaviour'! Are the criticisms of Ferrari misplaced? 'What on earth has this to do with F1? ', I hear you cry (assuming you're still awake). Well, the moral of the story is that if you start with a firm predisposition in mind (in the above case, that of the doctors assuming that their patients had a mental illness) there is a risk that you will interpret everything you encounter - however innocent, benign or contradictory - as evidence to support your predisposition. And I suspect that this has become the case in many quarters when they interpret Felipe Massa's treatment at Ferrari. While it seems beyond doubt that Ferrari, one way or another, dances to Fernando Alonso's tune these days, many nevertheless seem guilty of interpreting just about everything the Ferrari team does as an example of Fernando being favoured and further of Massa's chances being deliberately diminished to the end of assisting Alonso. The latest such case was in the race in Melbourne. Alonso was able to clear his team mate in the second round of stops by pitting sooner. This set off a round of grumbling in various outlets, that the timing of both drivers' stops was ordained to the end of 'screwing' Massa. The problem though is if this was indeed the case then it was also sophisticated enough to alter Massa's mental perception, as during the race via his radio he seemed to express a desire to press on rather than pit when Alonso did, and afterwards described Alonso's early stop as a 'risk' that Alonso took and that Massa didn't think at the time would work. Case closed you'd have thought, though those that I described above will no doubt find a way of contorting it all to fit in with their world view somehow (and one shudders to think what they would have made of it had Ferrari only given Massa a handful of laps of dry practice running with the latest upgrades on in Melbourne to establish a race set up, as Lotus did with Romain Grosjean). Ferrari is very much Alonso's team these days, as mentioned. But it doesn't necessarily follow from that Ferrari in cahoots with Alonso is sabotaging Massa at every turn. As we know, pre-season testing - and more to the point the efforts of those of us watching on to interpret it - doesn't give us the whole picture necessarily. Prior to the Melbourne meeting, some relative doom merchants murmured that on the basis of testing perhaps the latest McLaren wasn't quite au point. But it turns out such people were if anything being too optimistic and that Cassandra herself would have been closer to the mark. The MP4-28 looked evil to drive in Melbourne, and worse was nowhere near the pace in the normal run of things. Only two points could be salvaged from the weekend. The season is a long one of course, and the development race frenetic, so things could look very different in no time at all. But the glum faces in the McLaren pit in Melbourne were predominant. Perhaps inevitably, many have surmised that fundamental problems must have fundamental causes and have looked to the car's concept. The McLaren team, unusually, chose to go radical in its new design in comparison with its predecessor, more than just about any other team on the grid; it seemed rather odd when you consider that McLaren ended 2012 having the fastest car and that wholesale changes to the technical regulations await in 2014 in any case. For whatever reason, it seems to have been McLaren's way generally to rip things up and start again at regular intervals (and has been for at least the last 10 years). Compare this with the standard bearers at Red Bull: for all that we associate Adrian Newey with the avant-garde looking at recent Red Bull designs year-on-year one can see a clear evolution rather than clean breaks. McLaren could learn something from this. Martin Whitmarsh caused a minor stir in Melbourne by stating that it is 'possible' that McLaren will dig out last year's MP4-27 to race that while it sorts the MP4-28, as if to seek to commit some kind of mirror image of its previous errors. While bringing back an old car to replace a troublesome new one, either temporarily or permanently, is far from unheard of in F1's history (indeed, McLaren did something like this in 2003), it strikes me as an idea that's obsolete for a number of reasons, and I understand why Whitmarsh quashed the idea subsequently. In the age of severe testing restrictions, wherein the race weekend in effect becomes the on track development time for much of the year, how exactly can McLaren develop the MP4-28 if not bringing it to the track for race weekends? And even though the MP4-27 ended 2012 as the quickest car, how competitive will it be now having gathered mothballs since last November? After all, we're forever hearing about how rapid technical development is in F1. And if nothing else, surely the abandoning of its 2013 car would represent a massive loss of face for McLaren. For these reasons I expect McLaren to persevere with its troublesome MP4-28 no matter the trouble it has with it. There was rather a lot of barbed comment when Adrian Sutil (in competition with Jules Bianchi) was in the off-season being considered for the vacant Force India seat, and indeed after he was confirmed for it. Much of it was based on concerns about giving the drive to someone with a criminal record and still serving a suspended prison sentence, which is of course an honourable objection (though I didn't agree that Sutil should be precluded from consideration on that basis). But what troubled me more were apparent suggestions that he wasn't good enough for the role, as intimated when many claimed in dispatches that Sutil has 'had his chance' in F1. 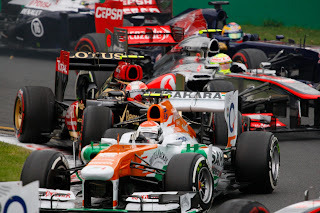 Adrian Sutil showed that view up for what it was on Sunday. He was an interloper among the front runners for much of the Melbourne race, twice leading and looking like he belonged absolutely in such company. OK, he was helped by missing out on the top 10 in qualifying which allowed him to start on the medium tyres rather than the fragile supersofts, but so did some others and they were nowhere to be seen (and there was nothing to stop anyone starting outside the top ten trying the same). And the doubters should have known better, after all there was the available evidence of his previous F1 efforts in the latter half of 2011 wherein Sutil was driving superbly, with the big finish of a great run to sixth place in the season-ending round in Brazil which helped him to ninth place in the final drivers' standings. Immediately though F1 turned its back on him, partly because of the trouble brewing off the track but also because at Force India he ended up in a three-into-two-won't-go situation with Paul Di Resta and Nico Hulkenberg for the 2012 seats, which not many drivers would win out in. No one would claim that Sutil will ever be an Alonso or a Hamilton. But in Melbourne he reminded us of what we should have already known: that on talent he is well worthy of his place on an F1 grid. And the guy that missed out in the race for the Force India drive for this year also turned a few heads in Melbourne. Jules Bianchi surfaced subsequently at the tail end team Marussia, and I'll admit that I was cautious about his potential. I considered his recent junior record a little hit and miss, though that many - including the Ferrari team which has been looking after his development - rated him very highly suggested some tangible underpinning to his 'next big thing' image. And he went a long way to proving me wrong in Sunday's race. Despite a relative shortage of testing experience in the Marussia, Bianchi was one of the stars of the show around Albert Park. He won the 'B Class' race clearly, and moreover ran in close company of the Williams and Toro Rossos, indeed ran ahead of Daniel Ricciardo, in his first stint, and set many impressive midfield-aping lap times throughout including one only 0.05 seconds shy of Vettel's best (though helped admittedly by a late stop for supersoft tyres). Those who were concerned that he would not be able to shine in such circumstances need not have worried. Indeed, we've seen in fairly recent times the likes of Fernando Alonso and Mark Webber distinguish themselves in tail-end Minardis in their debut campaigns. It is early days of course, in F1 as in anything else one swallow does not make a summer, and consistency has been a bit of a problem for Bianchi in recent years. But regular drives like that on Sunday will result surely in a growth in the number of his would-be suitors from further up the grid, not least from his paternal Ferrari team. And credit where it's due to all of the five driving debutants in Melbourne. Many predicted carnage, certain that they would trigger a first corner shunt. As it was all five stayed out of trouble (though Max Chilton did require a front wing change) and made it to the finish. And given all five have records from the lower formulae that can be described as solid at least we really should have given them greater benefit of the doubt.